This may already have existed elsewhere (in which case, sack this and point towards that), but: along with the good ship Super Play/N64/NGC/NGamer/Nintendo Gamer, what other gaming magazines did you read / do you still read? If you're an old fart like me, what old magazines did you read before NGamer? I still get GamesMaster (I know it's not a popular thing, but - look - the people writing in the mags are the peeps, or inspired by the peeps, that wrote the best bits). It's still good, but it's definitely a bit dry compared with the NGamer of yesteryear (and of course nothing compares with the N64-era craziness). I didn't collect many mags before NGamer - I was in my teenage years during the N64 era, and money was tight for my family, and it never occurred to me to subscribe to NGC magazine when I was a grown-up adult with a job. However, before that, I didn't read Super Play but TOTAL!. It started off alright (under the helm of the God-like Steve Jarratt, and then Frank O'Connor - yes that one Halo fans) but after a while became a mess and dissolved prior to the N64 era. Before that, I bought Amstrad Action! This was from 1990 to 1993 - when you think the Amstrad CPC was released in 1984, and pretty much ignored by Siralanlordsugar after that, the magazine basically kept an old tape-loading machine going for twice its natural lifetime. I bought loads of OPS1, purely because those demo discs were the bee's knees. I was into Gamesmaster around that time as well - I remember buying a copy of that around an anniversary of the TV show, and they gave away a DVD of some of the best episodes. I had a few copies of CUBE and NGC, but it wasn't until NGamer that I bought a games magazine monthly. I picked up a few OPMs when I was very young, like Jay for the demo discs. It was around the time I got my gamecube I got really into buying the Nintendo Official Magazine, which I bought all the way through the change to ONM and right up to the closure of that mag. Much like yourself, Jim, I was a staunch TOTAL! man for its entire run. Great mag until, as you say, it fell apart when the SNES was dying. Two things I remember: they gave Super Mario 64 100%, and the comedian Danny Wallace - the voice of Thomas Was Alone - wrote for them for a short while. Also very fond of Super Play but never got into N64 or NGC magazines - it wasn't until we got to NGamer that I started buying it again. Had a subscription, dontchaknow. And moved onto ONM once it was all over. These days I buy a handful of Retro Gamers and EDGE's but it's not the same. I saw someone the other day and I thought it was on here in a sig about a site which has a list of old games magazines, actually it was a link taking to me to Dreamcast stuff that more then likely was on a site related to that. But I've found this site and going through what I remember reading. On the old mags I've read a few over the years OPM like most was a big deal due to the demos and as a kid with limited money to buy or even rent games this was a fantastic thing, during the PS1 era and then on to early PS2. I did move on to OXM at the start for similar reasons but by then I would have been deep into having all the systems and as Games Master was cheaper then EDGE, I got as a sub pretty early into the life of the 6th gen and I've been in it three times and won my first HDTV which I got like 3 months after my 360 as I kept my sub up for years. I've picked up and read likes of EDGE, Games TM as well but along with the unofficial mags of the 360 but not sure which one. Nintendo wise I've read bits of Cube, G-Force, N64 Magazine, NGC Magazine this one I read the most as I loved the Cube, ONM the most after NGC especially during sort of early 3DS & Wii U, Planet GB I think I've still got a issue of it somewhere. Now NGamer I may have read some but to be honest the logo etc never seems familiar to me but I do know from elsewhere some of these are early entries to that magazine. 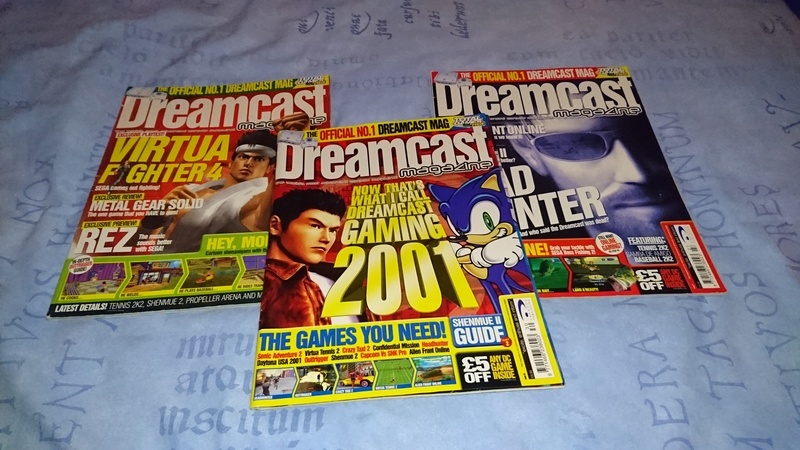 SEGA wise I still have some Dreamcast magazines and dam on eBay now they can go for a pretty penny this was part of Total Games.Net, I would have read bits of DC-UK which would be the NGamer equivalent, Official Dreamcast Magazine as that had demos. I never read any during the Saturn era but some during the Mega Drive but not sure what though, I can remember reading about Mortal Kombat II and Sonic & Knuckles etc but no idea what in. PlayStation wise it was mainly always OPM but with the odd other mixed in like Play. Basically OPM during PS1 with odd other mag, then a bit of everything next gen but mainly Games Master due to everything up in till sort of mid-to-late 2000's when the internet became the norm. Now I get a mag sometimes at Christmas or something or when OPM are doing a special like Final Fnatasy one this year. I got a handful of NOMs and ONMs. NOM was plain childish, ONM rather sterile (until its latter days). Way back in the day I bought CVG, but I didn't like it so much. All-format focus meant not enough Nintendo for my tastes, and at that time I was about six years younger than their target audience. NOM was incredibly childish, but I was a child. ONM was sterile initially (though there was humour to be found) but I was just turning into a teenager so I was too cool for childish things. Then just as I was discovering my personality, I found NGamer and that was life. I actually bought ONM all through its run, apart from a few months at the end of NGamer and Nintendo Gamer when I was struggling for cash and decided to limit myself to one mag. I now buy OXM, partly as I have an XBox and partly because Matthew now runs it. He's doing a nice job of bringing that NGamer charm in, with features and interviews and a monthly section about the barrels in games. My first magazines were the NOM ones with ol' Tim Street in. They were proper immature, with their anti-"Greystation" and "Lamecast" jabs, but I enjoyed their posters and often had exclusive reviews. But N64 issue 32 (the one with Shadowman on the front) converted me and I was a rabid N64 magazine fan all the way through until the change of name to NGC at issue 60. It captured the mood of being a Nintendo 64 fan perfectly. Most people at school (I was 12 in 1999) would have a Playstation, so the few lads that did have an N64 became my friends throughout secondary school. N64 Magazine felt like you was part of a club, particularly with their dedicated sections to high scores and creating new ways to play some of the older games. This was also because there were gaps in the release schedule, so you may have only had ten games for the N64 during its life, but you sure played the hell out of those games. I still feel that the Wii-U could have been made better by a dedicated magazine, just because the writers had to be super creative with articles to fill the pages. At Christmas 2000 (what an event that was!) I got a SEGA Dreamcast with Shenmue and recall buying the Official Dreamcast Magazine and one simply called Dreamcast Magazine. They were alright, and I remember them including reviews of CDs and comics too - this was when teenagers were also buying FHM and the like. Still remember reading the letters section in the Official Dreamcast Magazine when SEGA announced they were leaving the console industry - sad times. That was January 2001, yet the unofficial magazine ran until May 2002 which felt like they were keeping it going until the launch of the Gamecube. I stuck with NGC throughout its tenure up until the end of 2005 as I picked up an Xbox 360 shortly after it launched (with Ghost Recon and Perfect Dark Zero). I had a PS2 and an Xbox and picked up PSW for a bit, and some Xbox magazine too. They weren't particularly memorable. I didn't really get a magazine during the Xbox 360 days. In 2006 I was still at college and I would go to WHSmiths at lunchtime and just read the magazines, and in 2007 I went to university so tended to keep up to date via IGN or Gamespot. It wasn't until 2010 that I picked up a Wii (at 4am in Asda after a foam party, natch). 2012 was when I started buying magazines again, and funnily enough it was Nintendo Gamer (the re-brand worked on me!). I caught the end of the Wii and then moved to ONM with the Wii-U right through until it shut down in October 2014. With no magazine to follow I grew nostalgic and discovered this very forum. I regularly bust out those last issues of ONM (and the final Nintendo Gamer) if I'm laying a particularly lengthy cable and it does make me sad (the mags, not the poo). There's nothing better than opening that first page and cherishing each printed word, particularly when there were in-jokes and jam-packed pages with funny image captions. In the last year I've acquired the first two years of NGamer and have been enjoying reading them retrospectively. You'd think that there would be enough Nintendo fans to support a £5 a month magazine - I pray that the NX receives a magazine but it's unlikely. Yeah, I had a couple of early NOMs as well - one was bought as I think I was genuinely stuck on one part of Majora's Mask, and it had a guide in. It was clearly written for someone half my age, and there were many errors in the walkthrough, not just referential (there's no character with the actual name "Gerudo Warrior", and anyone who fits that bill ain't a bloke) to just plain logical ones. That soured my feelings towards that magazine through the next generation, and probably why I carried the "boo hiss" attitude during the NGamer days. Re Zero and Total! - oh yeah! I forgot about Danny Wallace writing for Total! He looks about 12. Some tips were sent in from a Kim Bissix from Bristol in a later issue - little acorns and all that. Nah, boss, that was me. Somebody was stuck on Tiny Toon Adventures: Buster Busts Loose!, if I remember rightly. Good times. That cover is amazing. Just look at it. I love the idea of a time when "net" was something you'd pick up Edge to read about. I remember those crisp, clear covers! The modern EDGE covers are covered with words - a strange thing for an NGamer fan to complain about, perhaps! - and some of the appeal has been lost. Yeah, I think that's a common thing these days - I subscribe to Empire and the covers I get are generally word free bar the title. Big excitement around AM2's Propeller Arena, Which was canceled due to 9/11 but it was done and the file went up on the internet and I have a download of the game, which is actually rather decent. I reckon Cappa would love the game. Virtua Fighter 4 preview of the arcade version, now they do talk about the game coming to PS2 but not DC even though it was planned as a DC game and there is a sort of demo disc of VF4 but this preview must have come after it was confirmed no more VF4 on DC. A good read but dam a lot of ads for random things also the DC we knew was dead and the magazine plays on that along with talking the piss out of the PS2 which at the time the library was still rather muh. Also nearly all the reviews were import reviews and talking about autumn years of the system, which you can tell and looking online at issues after 30 it's all about specials like racing games or what SEGA is bringing to the GameCube or Xbox. 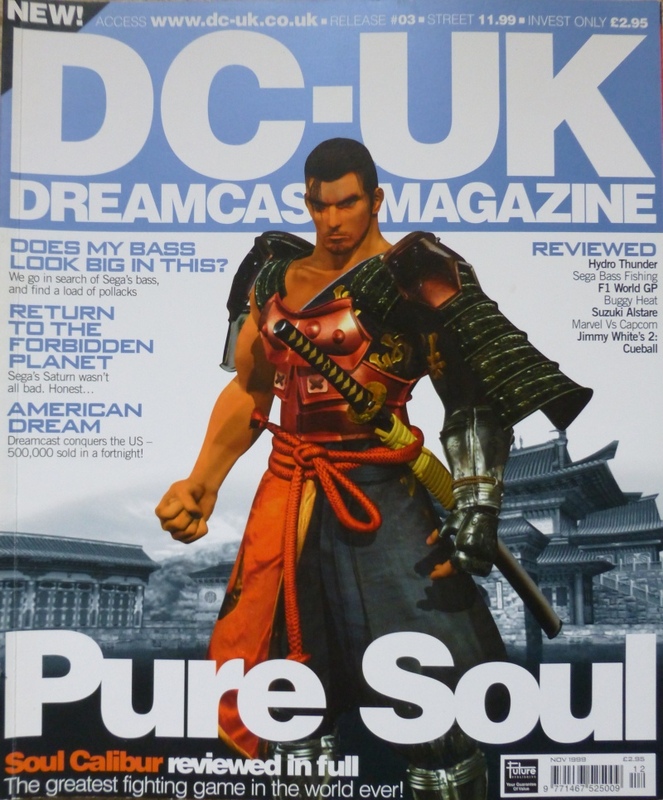 DC-UK were the daddy of dreamcast magazines, they generally had nice covers too. I had them as well but I never kept them back in the day and the DC Magazine ones, came with a bundle of games I picked up once. This thread has inspired me to look for scans of old magazines on the Net. The most depressing thing? The prices. £1.95 for the first few issues of TOTAL! The latest EDGE was £5.50 (although, for some reason, the self-checkout machine at Sainsbury's only charged me £5 - score!). Confidential Mission was awesome! It sits nicely between Virtua Cop and Ghost Squad as a cheesy James Bond light gun game. I think I got it for about £20 at the time, but it was great fun (plus it was the only other use for the light gun outside of House of the Dead 2). I was urghh when I played it and even in 2001 the DC would had a game better then that to go in a Top 10 of the year. I've never had much love the SMS hence why a load of games for that I want to see if I can play some how (I'll end up getting another SMS or a convertor), same really goes for the Mega CD. Most of the Saturn stuff in the book talks about are your well known titles which yeah I know I should play Panzer Dragoon SAGA but I'm not paying £250 for a SEGA Saturn game. Still I think these are on my look out for list Shining Force III, Die Hard Arcade, Burning Rangers, Guardian Heroes, Dragon Force more then anything on the Saturn. DC is a different story as I know nearly everything their is about it but but they do touch on some imports like Typing of the Dead, SEGA Marine Fishing, Cosmic Smash, SEGAGAGA, which might be worth having at. I also read the December issue of OPM which Chris Scullion has things in but dam that was December and the reviews were for things coming out late September / early October, I can see why gaming magazines are dying out. *gasp* I've played a couple of Sega games Mas hasn't - the universe really is imploding now! Shining Force was actually pretty good - albeit this comes from someone who has never played Fire Emblem. Golden Axe Warrior less so - it's alright if you'd like to play a slightly less balanced version of the original Legend of Zelda. Well back in the day Shining Force wasn't a game I would have played and now is more then I want to spend on a Mega Drive game. Same goes for Golden Axe Warrior because it's on the Master System which I've got pretty much zero love for the system and didn't get one years later and if I'm not going to pay a few pounds for Mega Drive, I'm certainly not for a Master System game.